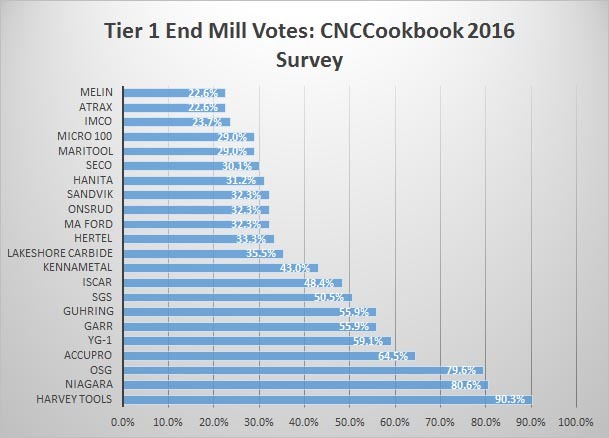 Nearly 1300 votes were cast for various endmill brands in our recent survey, and there were some 93 different end mill brands represented–WOW! The response to the survey has been amazing, and now it’s time to present the results. I have divided those results into 3 tiers since there are so many brands to consider. 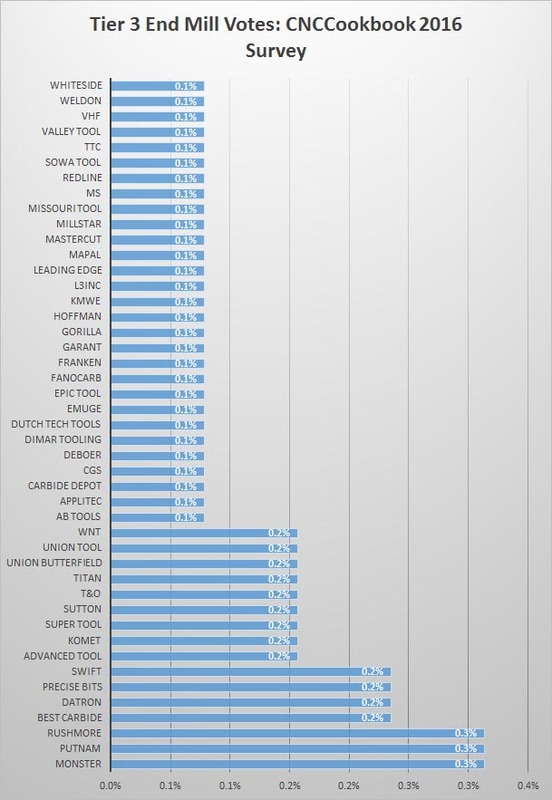 The top 3 brands were Harvey Tools, Niagara, and OSG. 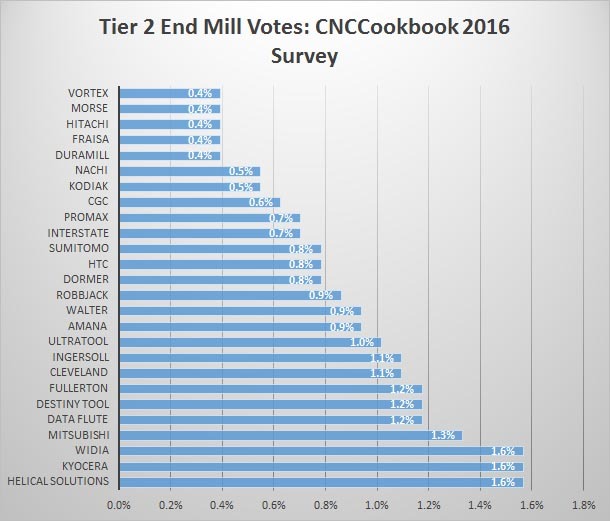 This was exactly the same top 3 in the same order as last year’s endmill survey. In fact, Accupro was also in 4th place last year. Kennametal and Iscar, two monster brands, fell off in favor of YG-1 (10th place in ’15 moved to 5th) and Garr (moving from 22nd to 6th!). I have to give special mention to Lakeshore Carbide for scoring so highly while being a relatively small manufacturer relative to some of the giants nearby on the list. They moved from 26th to 11th place. I guess Carl (Lakeshore’s owner) takes good care of his customers! Guhring, Hertel, and SGS showed steady progress, moving higher in the rankings. It’s always interesting to watch these market share shifts over time. Lots of very well-known brands in this category. I want to make special mention of Fraisa, which got more write-in votes (called out in the “Other” category on the survey) than any other brand. 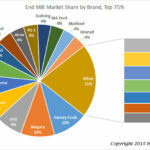 The overwhelming majority of you are seeking a good balance of value and performance, while all-out production performance ranks #2. 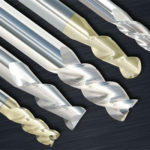 Very few shop for price alone, which is good news as it’s hard to get any kind of decent results with cheap endmills. But here’s where it gets interesting. 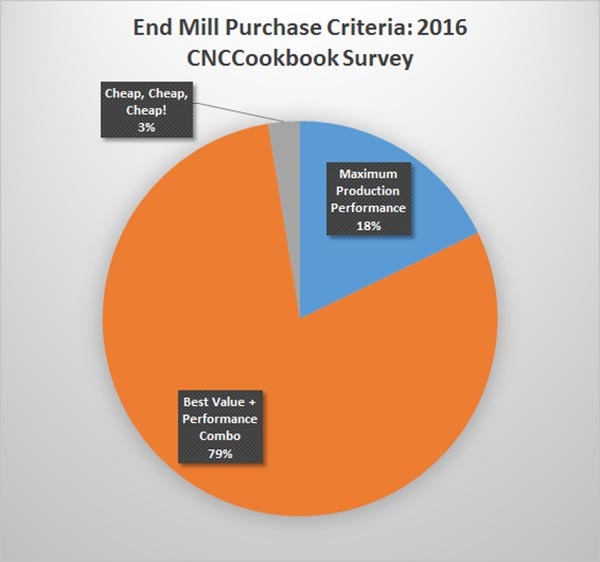 Which end mills did each group of buyers prefer? To find out, you need to be a CNCCookbook newsletter subscriber. You can sign up right below. Once you do, you’ll gain access to a variety of premium CNCCookbook content which we add to constantly, plus you’ll receive a weekly digest of CNCCookbook’s blog posts. We’ll also send you a few emails that tell you what our “Greatest Hits” articles have been over time. 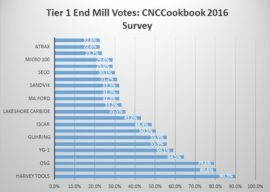 I would like to see a poll added for favorite endmill brand as well, not just a complete list of endmill brands used in the shop. While we have a handfull of Harvey tools, most of our tools are from SGS. It would be interesting to know the favorite brands for different material. Also what shops use turning out high tolerance parts vs hobby guys making parts for a kids go cart. Got to be honest, most of the time I go with Maritool because they list prices and it is easy to order. Perplexing why so many manufacturers hide prices, also you go to look up a tool and then are left wondering… so now how do I buy it? Harvey makes great tools, there is some obscure manufacturer in minnesota that lets you order online with a credit card without having to get a quote and submit a PO. Alex, I agree 100% with you. Perhaps it’s an irrational thing on my part, but I always feel that if someone is willing to pay a salesperson to “deal” with me, that can’t possibly be good for me! Plus, in an Internet age on something inexpensive as tooling, the transaction should be transparent and friction-free. Let big accounts making multi-thousand dollar orders deal with the salespeople. Weird thing is, the tools all drop ship direct from Harvey! Not sure what purpose their middle men distributors serve if harvey still has to do the fulfillment. 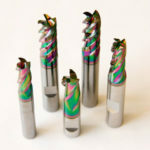 I have to go to harvey’s website find a tool, then go to walter hammond to order, then walter hammond tells harvey to ship me an endmill. Seems wildly inefficient. That being said, the stuff harvey has in stock ready to ship is amazing, I got an odd size double angle chamfer mill from them recently that you can’t get anywhere else without a custom order. 1. Marketing. Presumably the distributor has a house mailing list and customers for their other products that can be leveraged to sell a new line. Opinions on this vary–I know a retailler well who believes it is the job of the supplier to generate the demand. He actually does generate demand via step 2, but he doesn’t choose to think about it that way. 2. Handholding/Service. A warm body dedicated to a particular customer can often provide better service. This one is open to question for online sales, though. However, I suspect Walter Hammond probably has “Feet on the Street” who will go to shops in their territory and provide this kind of service and consultation. 3. Sales People. Having a distributor gets them off your books and diversifies your exposure. For smaller companies, a dealer network can get a lot more salespeople on your product than you can accomplish on your own. 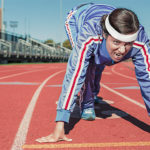 Those salespeople can do what most of us don’t like them doing, which is to negotiate higher margins and to close deals that we might not otherwise have moved forward with. Great points, drop shipping is efficient if you have a zillion distributors and a large product line like Harvey. To me a big part of the value in distributors is the handling of order processing / shipping, etc. Shipping and inventory management is a huge pain, and if you’re already doing it then why not also process orders directly? Maybe they sign agreements with distributors that says no direct sales allowed. I’ve always wondered why Harvey used this model as well, but my guess has been that it has to do with processing sales tax in all of the different states and municipalities in the country. I would certainly prefer it if I could just order directly from Harvey and pay no sales tax at all (since I am out of state for them), and not have to deal with the hassle and risk of transcription error from calling in the order to my in-state distributor. Bob, I totally agree. I gravitate away from places with complex processes and salespeople. Most of the time I will order from somewhere with an easy to navigate, well-organized site over somewhere where I have to call and thumb through a catalog. Even better if they are known for being prompt! That makes McMaster a top pick when I need it NOW, and lakeshore, maritool, and my local Garr distributor my choices when 3-5 days is fine. The main thing they all have in common is a navigable website and prices listed, with an “Add to cart” button next to them instead of “request a quote”. I too would like to see what the “Production Performance” folks are buying. 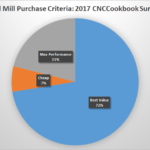 Don, sign up for our newsletter and you receive a supplemental premium report that has more details on this survey, including what the “Production Performance” folks are buying.